Harbor Management Commission Vice Chairman John Romano speaks to Common Council members Tuesday in City Hall. Listening at center is Shellfish Commission Chairman Pete Johnson. An Eversource rendering of overhead transmission lines in SoNo. 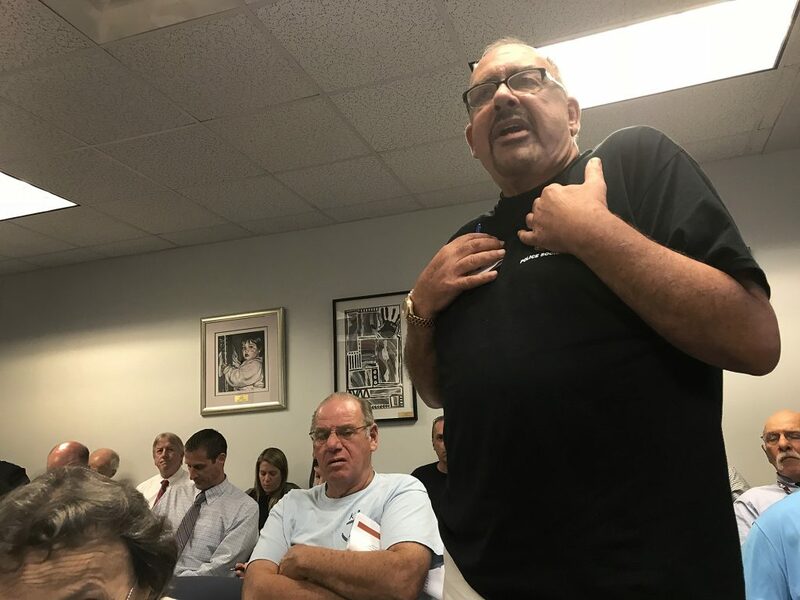 NORWALK, Conn. – Common Council members on Tuesday held off on agreeing to Eversource’s plan to bury high voltage lines under the Norwalk River, so that officials could request more information. The move came after members of the Harbor Management and Shellfish Commissions said Eversource lied to them, and Third Taxing District Commissioner Debora Goldstein said the application was being made in such a way as to avoid an environmental impact analysis of the plan to dig up Veterans Park. Eversource must remove the catenaries from the Walk Bridge, the railroad bridge over the Norwalk River, by 2020, Department of Public Works DPW Principal Engineer Lisa Burns explained at the joint meeting of the Public Works Committee and the Recreation and Parks Committee. The City in September 2016 requested that Eversource put the 115 kilowatt cables underground. The request was made directly to Eversource because the Connecticut Department of Transportation was not getting the message, Burns said. Burns explained that if the Army Corp application isn’t submitted soon, Eversource may move to construct overhead cables, because the Army Corp application takes at least a year and Eversource is obligated to remove the catenaries by 2020. Most of the citizens present for the joint meeting agreed that moving the cables underground is the preferable option, but two said the environmental impacts were a potential issue. The Redevelopment Agency has worked for nearly 50 years to relocate power lines underground for aesthetic and safety reasons, Norwalk Redevelopment Agency Senior Project Manager Susan Sweitzer said. The $150 million renovation of the Washington Village neighborhood might be less sustainable if the “eyesore” of overhead power lines is allowed, because it will be harder to rent market rate apartments, Norwalk Housing Authority Executive Director Adam Bovilsky said. “Our only issue is the direction that it’s taking,” Harbor Management Commission Vice Chairman John Romano said. Romano called Eversource “less than forthcoming,” and said many promised meetings don’t materialize. “We are not against it, we are just against the route as it is. The city spent tons of money putting in new docks. There’s more work to be done,” he said. The cable would go under the dock pilings. Romano and others say that Eversource will have to give permission for any work in that area, if the cable is there. The Harbor Management and Shellfish Commission have not signed off and had their questions answered, former Harbor Management Commissioner Diane Lauricella said. She opined that the underground cable shouldn’t go south of the Stroffolino Bridge, where “every spot” contains floatable oil that was left in the ground from an oil tank company. “Why would you want to aggravate or begin a bigger problem than you have now?” she asked. Lauricella noted that ConnDOT is going to be digging north of the Stroffolino Bridge and stirring that up, so the cable could go there to minimize toxic releases. Overhead power lines are restored to operation quickly after a storm, Goldstein said, speaking for the Taxing District. “The aesthetics of the harbor pale in comparison to the idea that environmental contamination might be stored in Vets Park, might in fact impact your shellfish business for the entire city. It might impede all the recreation uses of the harbor, and so on and so forth,” she said. She acknowledged that the “ship has sailed” because the City chose this path. Eversource will dig deep pits on either side of the river and fill them with chemicals, she said. “These routing options don’t get just engineered overnight… to go from a concept to an actual preliminary design takes months of work,” Burns said, explaining that Eversource worked on the plan between October 2017 and August. The selected option would route the cable well below the dock pilings — as deep as 30 feet under the river bed. The cable would surface at 70 and 90 Water Streets, close to the property line to allow for future development, she said. Running the cable down by the park’s basketball courts, which would take them away from the docks, isn’t feasible because there’s a “permit process that needs to be adhered to for Federal Highway Administration” and the cable “would put a permanent encumbrance underground and across the park,” which would “not be acceptable for funding purposes,” she said. Construction can only be done between November and February, she said. “Everybody” agrees the underground cable is the way to go, Public Works Committee Chairman John Igneri (D-District E) said. He explained that the decision is up to the Common Council and invited more questions. 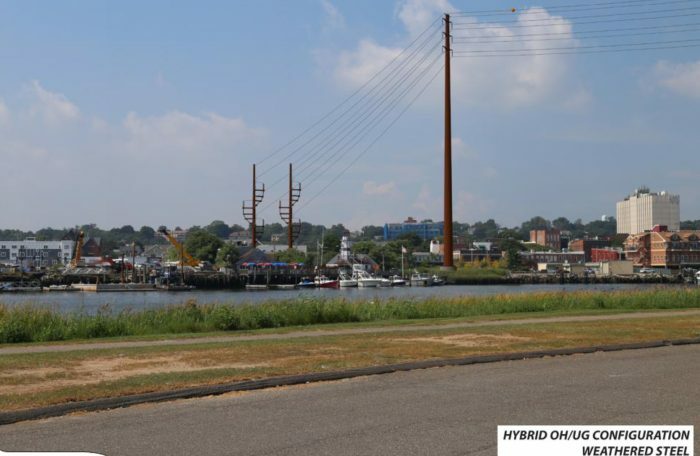 If the cable goes under the docks, “we are limited on future design and building in that area,” Harbor Management Commissioner John Pinto said. Eversource said the City would need permission, Johnson and others said. “I know it’s the cheapest way but why did they choose to go straight through our brand-new docks?” Third Taxing District Commissioner Pam Parkington asked. Because the Eversource project isn’t technically part of the Walk Bridge project, it wasn’t subjected to the environmental analysis required by federal law, Goldstein said. She later mentioned the difference between an application to the Connecticut Siting Council and the application for a declaratory ruling. The Army Corp of Engineers Section 408 permit is usually one of the last things to be done but Eversource goes and gets all the approvals before going to the Siting Council to make it appear everyone agrees, getting them around the environmental review, she said. The Public Works Committee later voted to table a motion to authorize Mayor Harry Rilling to send a letter indicating no objection for Eversource’s Section 408 permit, to see if Corporation Counsel can clarify the City’s rights if the cable goes under the Veterans Park dock and to see if an environmental analysis will be bypassed. The new information may come in ahead of Tuesday’s Council meeting; if members are satisfied, the item could proceed to a vote. Corporation Counsel “needs to look at the language to see what rights they have to (prevent) us to repair our own docks,” he said. It should be easy to clarify, Tom Livingston (D-District E), said. The Council would not be approving construction but saying they can go ahead with an application, Igneri said. Corsello mentioned a July meeting with Eversource, which he said went well. Burns said Eversource walked out unhappy, threatening to go the aerial route because there appeared to be no support for the underground cable. The Section 408 letter was expected to be on the August Public Works Committee agenda but was pulled, she said. Will the Council now investigate the huge cost to the City from the billion dollar Walk Bridge Boondoggle favored by Mayor Rilling ? Or just focus on the Eversoure cables tearing up the City’s harbor solely to help out the Developers ? Stay tuned. It’s an election year ahead. first lets hear some facts from lisa B like the ones she missed. Why wasn’t SNEW there? The underground pumping station for our water in South Norwalk is not on any diagram why? Its in Lisa’s pictures yet not clearly defined on water st. Its a bunker fed by gas on pumps that push water right where she said it would go underground. It cant go there unless the city moves the pumps. How does one find the bunker look at the square brick post in the middle of the sidewalk on water st its a vent for the pumps that run on gas or am i wrong? The path on water st side from the river to water street right thru a hazmat site is it not? Why not talk about the lot Lisa? Contaminated soil maybe? Id rather a overhead line or have they decided the contamination has gone? There is something wrong here folks. Lisa never once said the lot has a manifold system for collection hazardous waste. Does she even know? The path that goes to Oyster shell cant go straight why? Buried hazardous waste cells not on the map in the river , poor map Lisa not even a mention of crap in the river that should go that could be leaking. Its obvious the city has inexperienced members on the board the experts are in the crowd have more experience why was our top shelf experts not included at the table its sad the way this meeting was conducted. The video is outstanding is shows how uncomfortable some of our counselors are when questions are asked. Stop anyone from talking John showing your way over your head on this one. Rick you are correct. That is why we have commissions. The commissions HARBOR/SHELLFISH and now the newlt re-instituted WATER QUALITY committee should be taking the lead on this. These commissions look after the public good, weather it is recreational Boating, commercial water uses, construction water side or with-in regulated area. Shellfish, recreational and our very large world renowned Shellfish industry which generates Jobs, many millions in revenue and is a proud part of our heritage. Protecting the quaility of our recreational waters beaches and fish and fishing. With all the construction WALKBRIDGE/EVERSOURCE ETC going on and no real testing of the impact to our waters we are hog tied. Water quility should be getting a grant from Ct. DOT and eversource to purchase the equipment needed to keep all the aforementioned safe. The attached presentation looks be be riddled with inaccurate information designed to mislead the committee members into supporting the current underground plan. It also throws in a scare tactic of “approve this now or feel the wrath of ugly overhead wires”. This appears to be the same exact plan that has been rejected over the past year yet Eversource has made no attempts to find a alternative path. Lisa Burns should be ashamed of herself for siding with Eversource over citizens of Norwalk. Who pays her salary? What about the consultant hired by the city to manage Walk Bridge related projects? Sue Prosi? Both useless to citizens of Norwalk and appear to have prioritized Eversources needs over what is best for Norwalk. @Mr. Bovilky. Have you seen the monstrous lift bridge that ConnDOT is planning for the Walk Bridge replacement? You need not worry about unsightly power lines. But, if this is indeed your concern, why are you not speaking out on the negative impact the bridge will have on the rental market? Lets say if our Mayor is making the call for the go ahead for any project in the city would he have to be contribution free from not only Everssource but others like Trinity Financial? We here all the time special interest and if those in the video who spoke with passion and facts are ignored to further profit from the power line burial and not take into consideration if there is any money trail I think your average taxpayer has been scummed. Im hearing and now and has to be vetted money has been going to the next election from Trinity Financial. One meeting we were told the contamination at Vets park is far more serious than most lots in Norwalk by a RDA member.Why was this not discussed by those running the show? Then we heard and read a report on Ryan park detailing the chemical companies the foundries yet the city when buying NEON city said their study said the lot was clean by a company they hired.No indication there was a problkem lets put kids in the building Simom says its ok.
Now Susan from the RDA has on file the sites including NEON and state this. encroachment condition (VEC) has been identified for the Site. The potential presence of a vapor encroachment condition (VEC). This means Elizabeth st folks. Lets dig disrupt the unknown let the water table push into all the homes on Elizabeth st and push bad stuff into Norwalk Harbor while John Igneri ignores logic not given to him. Its a grand slam for the mayor susan lisa and Trinity. a small portion of the parcel. Means never cleaned up yet close to the Eversouce dig have I lost anyone yet? It means also in most remediation projects the scope the cleanup stops at the lot line. Those who live on near Elizabeth st beware “Wolf in Sheep’s Clothing crafting and twisting it so much, we might even find ourselves feeling confused over what real truth is anymore. Agency Senior Project Manager Susan Sweitzer and Lisa Burns should be removed from this project and new board in place including a SNEW member and not Westmoreland with his ties to the RDA. Send the counsel members to environmental school and fire the principal to Norwalks school of magicians and clean house. There were people in the room for this meeting much more versed than I, those paid and bought for were obvious they spoke first Not you John or Pete those who have no clue what I wrote existed generated by their own city. Now we have Murhpy Himes Duff and others who need to read understand the environmental reports before the next election and simply tell us they too after using the city RDA and others to advance trust. it now should be limited until all the facts are in. Where are the grants? Where have the grants gone and where should new ones go? The taxpayers have been screwed it was not selective from all parties everyone seems to have been mislead. Yes lets dig up the ground lets let all those pockets as one woman said exist flow everywhere lets let the new Millennials know what caution was used to walk your children through puddles of water with blue sheen its ok the city has your back. I did leave out a lot of facts too much is not good too little is what we have had. I ask the board before you make another NEON blunder think twice before giving the Mayor the go ahead time limits are for amateurs show us your not. If our fate is in your hands wash them first before the next meeting.